As Bitcoin is becoming more and more popular and its price keeps going up, more and more people are getting interested in investing in bitcoin as well as other cryptocurrencies. For people in China, Alipay and WeChat are the two most popular payment methods these days. You can pretty much buy anything with the Alipay and WeChat apps installed on your smartphone. So many people are wondering: Can I buy bitcoins using Alipay or WeChat? The short answer is yes. However, we must add that it’s not quite easy to do so yet. We will show you why and how. Buying bitcoins in China used to be very easy, when people can easily open up accounts at Chinese bitcoin exchanges such as Huobi, OKCoin etc. However, due to new government regulations implemented in 2017, pretty much all bitcoin exchanges in China were shut down. As a result, buying bitcoins in China these days is much more difficult. Although bitcoin exchanges have been shut down in China, owning bitcoins, buying bitcoins and selling bitcoins individually are not illegal in this country. Many people choose to use overseas exchanges to buy and sell bitcoins, but it’s not always easy to open such accounts (not to mention WeChat and Alipay are usually not accepted). Some other people choose to trade bitcoins offline, meaning face-to-face, but this way has some security risks associated with it and the process could be troublesome. Given the current situation, many people in China have been using peer-to-peer bitcoin marketplaces such as Localbitcoins to buy and sell bitcoins. As a matter of fact, at Localbitcoins, you can buy bitcoins using WeChat and Alipay. Peer-to-Peer bitcoin trading means that you buy and sell bitcoins with another individual. A bitcoin seller can specify which payment method(s) he/she accept. For those sellers in China, many of them accept Alipay and WeChat, as these two are the most popular payment options. 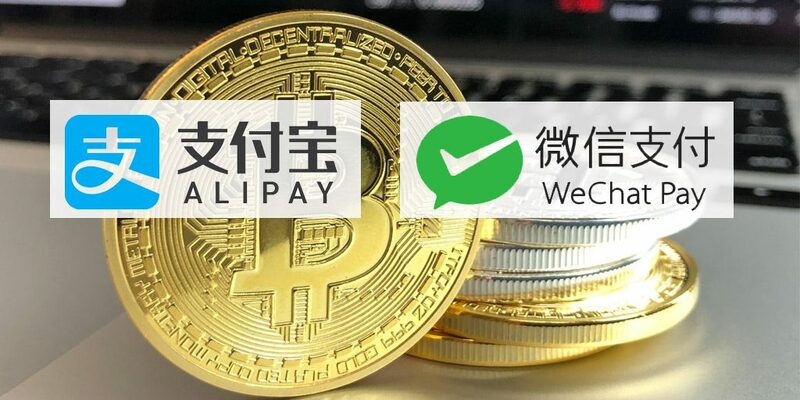 To buy bitcoins using Alipay or WeChat, you first need to register an account at Localbitcoins, then you can search for bitcoin sellers accepting Alipay and WeChat. When you do a search, you might be able to find quite some sellers willing to do so. After you have identified a bitcoin seller from whom you want to buy bitcoins using WeChat or Alipay, you can start your buying process. When you are paying the seller using Alipay or WeChat, Localbitcoins serves as an escrow service for the payment process to ensure you get your bitcoins after the payment has been made. Also, it has a reputation system that allows people to rate bitcoin sellers based on their experiences. When you buy bitcoins using Alipay or WeChat on Localbitcoins, you should keep in mind that although you are protected by Localbitcoins’ escrow service, that’s not to say all trades will be safe and care-free. You should take some time to learn the process and study the sellers to see whether this seller has a good reputation.